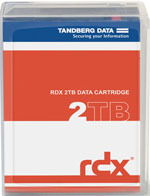 The Tandberg Data RDX QuikStor is a disk-based storage system with removable cartridges that offers rugged, reliable and convenient backup, ideal for the SOHO and SMB markets. With SuperSpeed USB 3.0, the system provides performance up to 180MB/s. 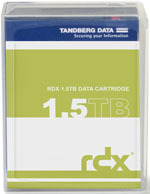 On this video you can see how the RDX has been ruggedized for reliable, easy and portable backups. First they're sealed bearings that can last likely 50yrs. A very important feature of an RDX technology is the ramp loaded heads. The heads that normally float over the disk drive while it's seeking data, when it's not in use it's powered down these are pulled away from the media locked down, that's important for two reasons: One is the shock, the other sticktion. You have standards technology with the roadmap, available in ranges from 500GB up to 2TB, able to keep it on the shelf for 30yrs in a rugged package that's protected from shock and any other abuse you may run into. 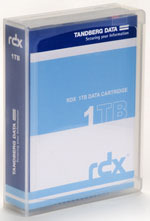 Checkout the video below - Take a look inside an RDX removable disk storage cartridge.